Both the transmitter and locator are compatible with a wide range of accessories. When an accessory is connected, the locator or transmitter will recognize it and will enable the mode appropriate to the accessory. For example, attaching an A-Frame to the RD8000 marker locator will automatically switch the locator to fault-find mode and limit the number of available frequencies to those that are compatible with the A-Frame. The LCD will also display an icon of the accessory and will remove any nonessential icons from the screen. 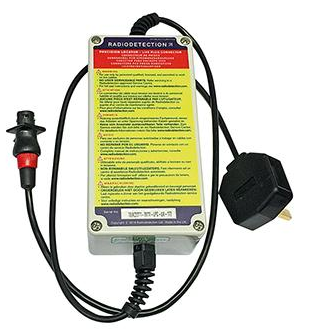 Radiodetection supplies an optional headphone set for the RD8000 locator. 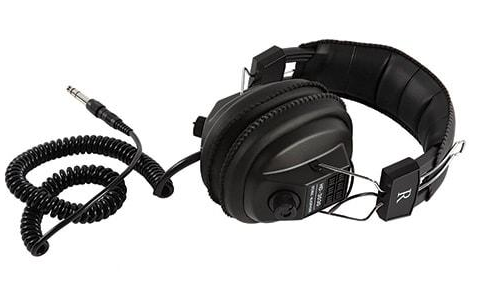 The headphones feature an adjustable headband to ensure a tight fit when used in the field. The accessory headphones also feature volume adjustment for both left and right speakers. Connect the 3.5mm headphone jack into the locator’s headphone socket, which is located next to the accessory panel. WARNING! Before wearing headphones, lower the locator’s volume levels to help prevent damage to your hearing. WARNING! Wearing headphones may impede your awareness to dangers in the field such as moving traffic or other heavy machinery. Exercise caution! A locator clamp is used to positively locate and identify a cable when several cables are running close together. 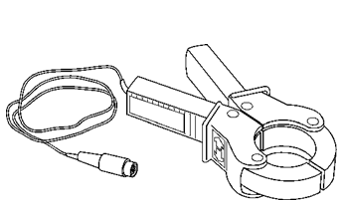 A target cable can be identified in a chamber, on a tray or other access point by fitting a clamp to the locator and examining each cable in turn. Signal strength response shown on the locator display should be noted for each cable. 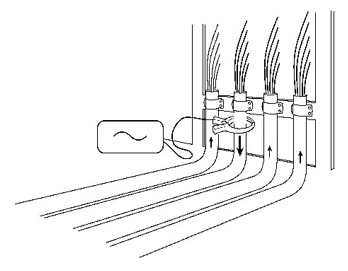 Several cables or pipes run in close proximity to each other. 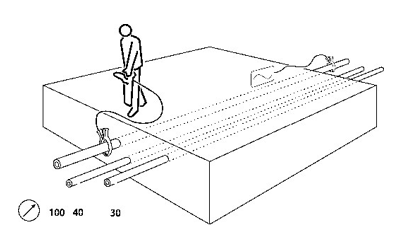 A cable or pipe is accessible at an inspection hole or manhole. NOTE: The standard clamp cannot be used with CM or CD. A special CM/CD clamp is available. Put the clamp connector into the accessory socket on the front of the RD8000 marker locator. Place the clamp around the pipe or cable and switch the locator on. Set the frequency to the same as that on the transmitter. Put the clamp around each cable in turn and note the bar graph response. Compare the strength of response from each cable. The cable with a substantially stronger response than the others will be the cable to which the transmitter signal has been applied. To ensure that the target cable has been correctly identified, reverse the positions of the transmitter and locator and check that the strongest response is still received from the target cable by the locator in its new position. The clamp plugs into the locator accessory socket and is used for cable identification at points where the cable can be accessed. The standard clamps are suitable for cables up to 100mm (4”) diameter. The small clamp performs the same function as the standard clamp but is useful in cramped situations where there is insufficient access for the standard clamp. The small clamp is suitable for cables up to 50mm (2”) diameter. The CM clamp plugs into the accessory socket of the locator and enables CM measurements to be made on individual cables. This accessory is used to identify a particular cable that is bunched with several other cables or in close proximity to other cables. The combination of direction current and current magnitude is extremely useful for identification purposes. 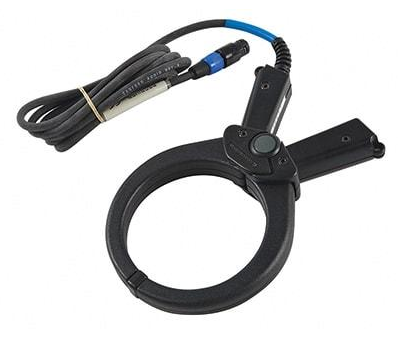 The transmitter clamp fits around a pipe or cable and safely applies a signal to a live insulated cable without interrupting or disconnecting the supply. 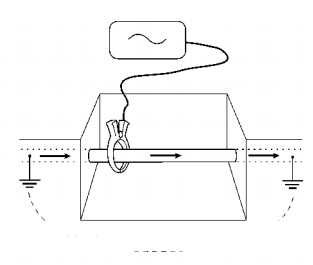 The clamp applies a very discriminating signal to a target line with reduced coupling to other lines. A clamp can sometimes be a more effective method of applying the signal than Direct Connection. The target line will carry the strongest signal. The other lines will carry the weaker return signal. If the system comprises only two conductors, they may carry equal signals. WARNING! Do not clamp around uninsulated live conductors. WARNING! 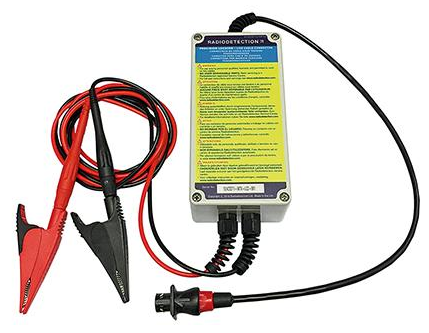 Before applying or removing the clamp around a power cable, ensure that the clamp is connected to the transmitter at all times. The clamp may buzz or vibrate if it is placed around a power cable that has significant net current flow. This is normal and does not harm the equipment. Plug the clamp into the transmitter output socket. Put the clamp around the pipe or cable and ensure that the jaws are closed. Switch the transmitter on. The display will show the Clamp connected icon. The line should be grounded (earthed) on each side of the clamp for the signal to transfer to the line. Ground the line if necessary. 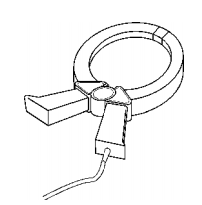 An insulated cable may be traced even if it has no actual ground connection, providing a reasonable length is buried either side of the clamp to provide capacitive coupling to ground (earth). NOTE: It is not necessary to make a ground connection from the transmitter when using the clamp. Although transmitter and locator clamps look the same, they have different internal windings. To prevent the wrong clamp being connected, transmitters and locator clamps have plugs of a different orientation. The standard clamps apply the transmitter signal very selectively and effectively to a target cable up to 100mm (4”) in diameter using frequencies from 8kHz to 200kHz. The standard and small clamps have a double spring action for positive toroidal contact. The small signal clamp is useful for applying signals from 8kHz to 200kHz to a target cable in a pedestal or other place with limited space. The clamp is suitable for cables up to 50mm diameter. The CD clamp plugged into the accessory socket of the transmitter enables CD signals to be applied to individual cables. WARNING!. The transmitter must only be connected to live services using the appropriate accessory such as a plug connector or live cable connector.